Down the streets of cafes, restaurants, bistros along town, this is perhaps one of the best coffee places you can find. Well, at least just for its coffee; there isn't much to boast of for its mains (at least for the ones I've tried). I didn't have a good impression of its main courses as I tried its prawn spaghetti sometime back and it was a disappointing shot. The pasta was too oily and the flavour got too 'jelat' soon after. I was hence abit hesitant going back there for brunch but was convinced by a friend who's tried it before. This was the only hit for me, an ordinary-looking dish of scrambled eggs that tasted extraordinarily good! I started my gastronomic experience from the toast, where it was finely baked, slightly crisp on the outside and also tasted a little on the sweet side. It reminded me of a very well toasted version of the famous 'fa-bao' at Whampoa Drive. The magic came as I was surprised by the strong truffle taste infused in the scrambled eggs. The scrambled eggs were slightly on the creamy side, and were very smooth. Every mouthful had a rich flavour of truffle that bursts in your mouth, adding the extra twist to the otherwise boring scrambled eggs. The generous serving of cured ham also complemented the dish very well with its savory taste topped with more truffle spread. This would be one dish that I'd return for! This was well, classic. The poached eggs were quite well done but it was abit cold for my liking. The hollandaise sauce was also abit sourish, and wasn't exactly the type that I was expecting. Plus point though, I liked the thick slice of honey-baked ham that went with the egg. It substituted the usual bacon, which explains the lack of that extra crisp for this dish, but felt a little less sinful. It was an okay dish, thought you can easily find better ones elsewhere. 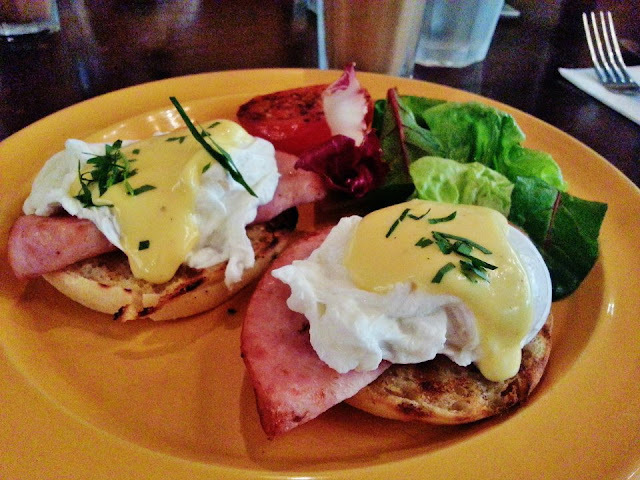 A slightly more unique version compared to the usual Eggs Royale that I can find, it replaces the usual cold smoked salmon with the hot version. It is less moist as compared to the usual cold smoked salmon, but I thought it was a better rendition with the complementing textures. This is listed under their competition coffee so I reckoned that it's a tad more unique than the other coffees you get. Coffee art never fails to amaze me, and this has successfully won me over. It was rich and creamy, with a strong fragrance and I liked the rather subtle refreshing citrus zest. Then again, I'm no coffee expert so to put it simply, I liked this blend. This is another one of their competition coffee. It comes with a cinnamon stick that's used as a stirrer so it adds a touch of cinnamon to the coffee. I didn't really taste the 'spice' from the chilli, but the fragrance of the cinnamon added a really fine touch to it. It was quite an acidic cup of coffee I thought. Another one that I liked but forgot a picture of, is their iced mocha. Unlike usual coffee stops, the chocolate in it wasn't overpowering and there was still a strong coffee flavour. It was fragrant and smooth, and the chocolate added a sweet touch to it. Very nicely done! It's usually quite packed regardless of the time I go. And yes, to catch their brunch, it's only available on Sundays and Public Holidays, 10am - 3pm. It's quite a good place to chillout, having a chat over coffee in the afternoon and having live band at night. It would have been better though, if service staff didn't clear our tables so quickly that it seemed as though they were chasing us away. I'd definitely return for the scrambled eggs and their iced mocha again!